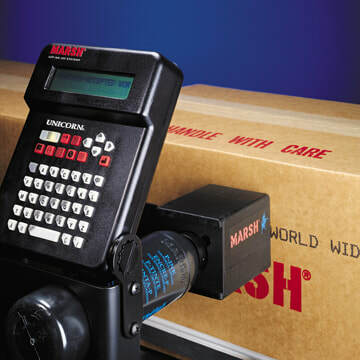 The MARSH Unicorn II can print two lines of code on your case with the same great features as the MARSH Unicorn. Simple to set up and operate, the Unicorn II facilitates quick installation and enhances productivity. The system includes a controller/keypad, a printhead, a power pack, a power cord, a pressurized ink bottle and brackets for mounting directly to a conveyor. The hassle-free ink bottles can be replaced quickly and conveniently, and do not require an external air supply. Intuitive icons allow operators to adjust and edit product codes within the Unicorn II interface — including time and date codes, expiration dates, and rollover hours — with a few simple keystrokes. Menu-driven programs also enable electronically accurate automatic date changes, clock functions and consecutive counts.